Cambridge, MA – Forward-looking foodservice executives and culinary professionals will convene at the second annual Menus of Change national leadership summit, which takes place in Cambridge, MA June 9–11. They are gathering to gain the knowledge and skills necessary to succeed at a time when the industry is being shaped by the convergence of public health, nutrition, and environmental concerns like climate change and drought, which have moved from future worries to current risks and costs for food companies. "Change is in the air. Diners increasingly care and know more about their food choices while environmental challenges bring mounting unpredictability to the farms, ranches, and fisheries we rely upon," said Dr. Tim Ryan, president of The Culinary Institute of America, which co-presents the initiative with Harvard School of Public Health–Department of Nutrition. "Our industry's future looks to be a more complicated one in which to navigate. From antibiotic resistance and new diseases in the livestock industry to persistent droughts and still-stubbornly high rates of obesity, we may very well be witnessing something of a 'perfect storm' that will demand not merely small changes around the edges, but entire paradigm shifts over time." The summit offers unique opportunities for business and culinary leaders to collaborate, as well as hear practical advice on key issues such as rethinking the role of proteins, fruits, and vegetables and developing menu strategies to address climate change. Scientists and industry experts will provide insights and advice that integrate the latest scientific findings from the fields of nutrition, food systems, and environmental sustainability. "This year, the scientific community reached significant agreement on the public health impacts of sodium and sugar-sweetened beverage consumption, for example," said Walter Willett, MD, DrPH, chair of Harvard School of Public Health–Department of Nutrition. "While scientific research and debate about details of magnitude and timing continue in these and other areas, there is movement towards greater certainty. Menus of Change provides a valuable opportunity for foodservice industry leaders to understand that process better and recognize when it is time to change and not wait longer, as well as the practical business benefits of timely action." "The culinary profession is no longer just that of a white toque, but also a white collar, where knowledge and decision-making create value," added Arlin Wasserman, chair of the Menus of Change Sustainable Business Leadership Council. "The foodservice industry is providing a greater share of our meals than ever before, both winning in the marketplace and also facing an increasingly complex and challenging set of choices. The Menus of Change initiative shares unique guidance on how to make better choices and run better businesses." The second edition of the Menus of Change Annual Report will be released today at the summit. It includes a dashboard showing the past year's progress on a set of critical issues at the intersection of public health and nutrition, environmental sustainability, and business. The report also includes analyses of those issues and case studies featuring companies that have successfully combined sustainability and profit. The Menus of Change Annual Report was developed in collaboration with leading scientists and business experts who sit on the initiative's Scientific and Technical Advisory and Sustainable Business Leadership councils. Its Principles of Healthy, Sustainable Menus provide chefs and foodservice leaders with groundbreaking guidance on menu and recipe design and business operations that integrates both environmental and nutrition science imperatives. A full version of the report, along with supporting visuals and additional information about the Menus of Change initiative, is available at www.menusofchange.org. The 2014 summit's presentations will be available there in July, and in the meantime, anyone can follow news from the conference on Twitter with the hashtag #CIAMOC. 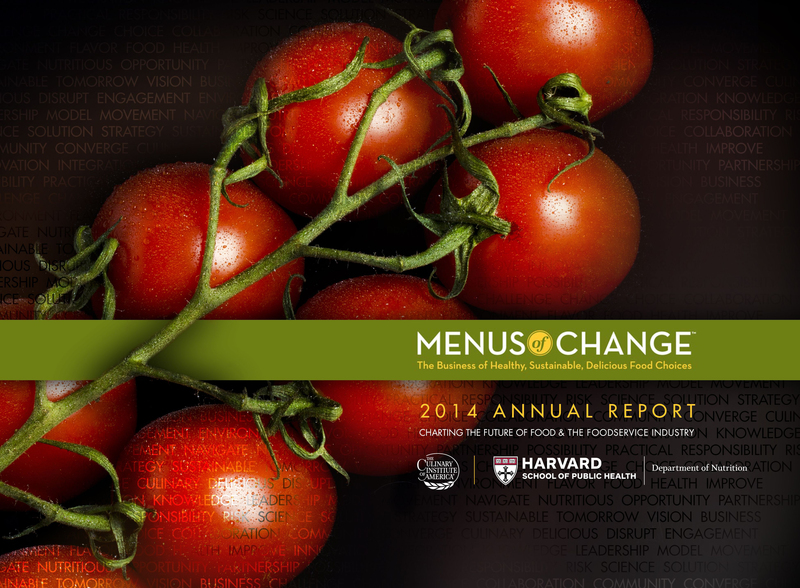 The 2015 Menus of Change conference will be held June 17–19 at the Marriott Pavilion on The Culinary Institute of America's Hyde Park, NY campus. Registration opens September 2, 2014. Founded in 1946, The Culinary Institute of America is an independent, not-for-profit college offering associate and bachelor's degrees with majors in culinary arts, baking and pastry arts, and culinary science, as well as certificate programs in culinary arts and wine and beverage studies. As the world's premier culinary college, the CIA has a network of more than 46,000 alumni that includes many industry greats. The college has campuses in New York (Hyde Park), California (St. Helena), Texas (San Antonio), and Singapore. In addition to its degree programs, the CIA offers programs for professionals and food enthusiasts, as well as consulting services in support of innovation for the foodservice and hospitality industry. The Industry Leadership Division organizes nearly a dozen programs and initiatives annually on the subjects of flavor, world cuisines, and health and wellness. Harvard School of Public Health is dedicated to advancing the public's health through learning, discovery, and communication. More than 400 faculty members are engaged in teaching and training the 1,000-plus student body in a broad spectrum of disciplines crucial to the health and well being of individuals and populations around the world. Programs and projects range from the molecular biology of AIDS vaccines to the epidemiology of cancer, from risk analysis to violence prevention, from maternal and children's health to quality of care measurement, and from health care management to international health and human rights.